This condition is most often spotted at either the first or second puppy checks or between 6 and 8 months of age as the permanent (adult) teeth erupt. Either the deciduous or permanent lower canines occlude into the soft tissues of the roof or the mouth causing severe discomfort and, possibly, oral nasal fistulae. See our FAQ sheet for further information regarding this condition in young pups. The fact sheet answers many questions you may have about the cause of this problem and the various treatments available. It is important not to delay treatment of deciduous lower canines as the window of opportunity is only a matter of a few weeks until the permanent canines erupt at 22 to 26 weeks of age. A new problem can then present with bigger teeth causing more damage. We advise you email us images of the teeth (mouth closed, lips up and side on for both left and right) just a few days before you travel. Things change quickly in growing dogs and it might save you a wasted journey. This is an inherited condition - an autosomal recessive mutation. Both parents may look normal but carry recessive genes for the condition. When this genetic information is passed onto the litter, approximately one pup in four will be affected, appear abnormal and can pass the genetic information on if bred from. In addtion, two pups in four will carry an abnormal gene from one parent and a normal gene from the other. This pups will look normal but can pass the problem on if bred. Finally one pup in four will not be a carrier of abnormal genes, will be unaffected and cannot pass the trait on to future generations. If this condition appears in the litter, the most responsible course of action is not to breed from the parents again - either as a pair or individually with others. As there is currently no test to identify this gene, selecting another mate may mean they too are recessive carriers. All the normal looking sibling pups are likely to also carry the recessive genes. It is wise that they too do not contribute to passing the problem back into the breed's gene pool. In many affected breeds, the gene pool of breeding individuals to select from is very small. If recessive carriers are routinely mating then it is not long before increasing numbers of pups appear with this condition. Over four decades we have monitored the breeds treated here and it is disappointing to note that many previously unaffected breeds are now being seen on a regular basis. When a pup is treated for this condition we routinely supply the Kennel Club with a Change of Conformation form so they can track the parental origin. We also ask for permssion to send a DNA swab to the Animal Health Trust. This is anonymously evaluated as part of a research programme to identify the exact genetic origin of the condition with the aim of a simple test becoming available to identify recessive carriers. In time this will allow owners of known recessive carriers to select a mate unaffected by the condition. Firstly, and most importantly, these teeth are sharp and hitting the soft tissues of the palate. These pups cannot close their mouth without pain and often hold the mouth slightly open to avoid contact. This is not pleasant. See above for an example of the damage caused to the hard palate by this problem. Secondly, the growth of the mandible is rostral from the junction of the vertical and horizontal ramus. If the lower canines are embedded in pits in the hard palate, the normal rostral growth of the mandible(s) cannot take place normally due to the dental interlock caused by the lower canines being embedded in hard palate pits. This can cause deviation of the skull laterally or ventral bowing of the mandibles (lower jaws). Thirdly, the permanent lower canine is located lingual to the deciduous canine. This means that if the deciduous lower canines are in a poor position it is a certainty the permanent teeth will be worse. See the radiograph below. The deciduous canines are on the outside of the jaws and the developing permanent canines are seen in the jaw as small "hats". It is clear that the eruption path of the permanent canines will be directly dorsal and not buccally inclined as is normal. For these three reasons it is advisable to surgically remove the lower canine teeth as soon as possible to allow maximum time between the surgery and the time the permanent teeth erupt at between 22 and 24 weeks of age. 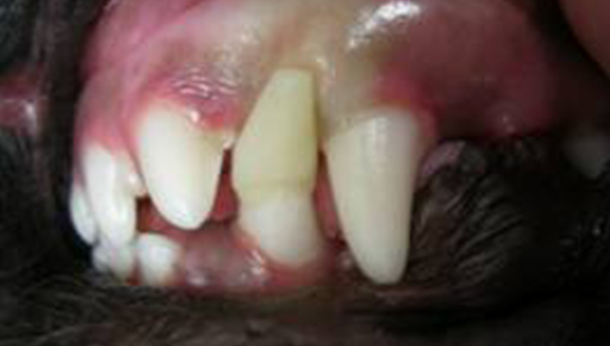 See our file for illustration of removal of deciduous canines. The deciduous tooth root is three to four times longer than the visible crown and curved - often 2.5cm in length and curved. The root apex is often located below the third lower premolar. See middle and right images below with extracted deciduous tooth laid over extraction site. The roots are very fragile and will break easily if unduly stressed during removal. A broken root needs to be identified and removed otherwise it continues to form a barrier to the eruption path of the permanent canine and can cause local infection. The permanent successor tooth is located lingual to the deciduous tooth and wholly within the jaw at this stage. Any use of luxators or elevators on the lingual half of the deciduous tooth will cause permanent damage to the developing enamel of the permanent tooth. See the images below showing canines (and also the third incisor) with extensive damage to the enamel. The radiograph also shows how much damage can occur to the teeth - see the top canine and adjacent incisor. Some severely damaged teeth need to be extracted while other can be repaired with a bonded composite. This damage is avoidable with careful technique using an open surgical approach. Surgery to remove the deciduous canines may not prevent to need for surgery on the permanent canines but, without it, few cases will resolve if left to nature. Many owners are reluctant to have young pups undergo surgery. Our view is that surgical removal of the lower deciduous canines will not guarantee the problem does not happen again when the permanent teeth erupt but without surgery the chances are very slim. In a few selected cases - usually only very mild lingual displacement - we can consider placing crown extensions on the lower canines to help guide them into a more natural position. It carries some uncertainly and will not be suited or work in all cases. The images below show crown extensions on a young Springer Spaniel. Please note that the use of a rubber ball to assist tipping of the deciduous lower canines buccally is not appropriate at this age and will not work - see below. If the permanent teeth are lingually displaced the pup is usually older than 24 weeks. The trauma caused by the teeth on the soft tissues can be considerable with pain as a consequence. There are many misconceptions about ball therapy. Please read the following carefully. Do not try ball therapy with deciduous (puppy) teeth. There are two main reasons for this. Puppy teeth are fragile and can easily break. 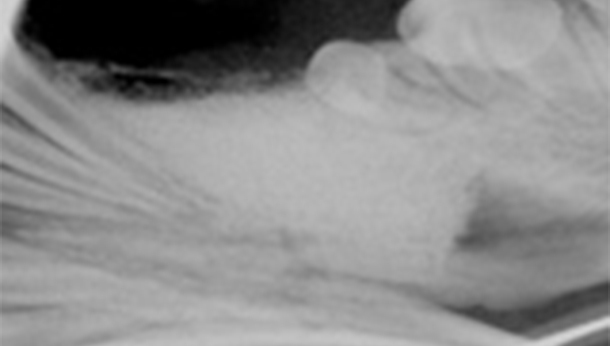 More importantly, the adult canine tooth bud is developing in the jaw medial to the deciduous canine tooth (see radiograph above in the puppy section). If the deciduous crown tips outwards the root will tip inwards. This will push the permanent tooth bud further medial than it already is. Ball therapy will only work with adult teeth and only in some cases where the lower canines have a clear path to be tipped sideways - laterally - through the space between the upper third incisor and canine. The window of opportunity can be quite short, around 6 weeks, and starts when the lower canine teeth are almost making contact with the hard palate. If you are considering ball therapy ask your vet their opinion and get them to send us images of each side of the closed mouth from the side with mouth closed and lips up. The size and type of the ball or Kong is critical. The ball diameter should be the distance between the tips of the two lower canine teeth plus 50%. Therefore if this distance is 30mm the ball diameter is 45mm. If the ball is too small it will sit between the lower canines and produce no tipping force when the pup bites down. 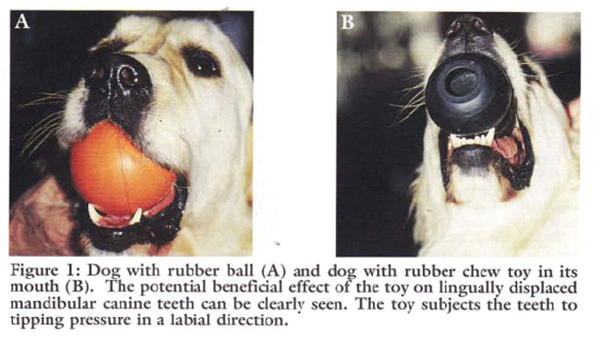 Too large a ball can intrude the lower canines back into their sockets. The ball should "give" when the pup bites down. The smooth semi-hollow rubber is best. Tennis balls are abrasive and can damage the tooth surface but for a short time may do the job we require. The owner needs to encourage play with the ball several times a day (6 - 8) or as often as they will tolerate with a short attention span. The ball should be only at the front of the mouth to go any good. If there are no positive results in six weeks a further veterinary evaluation is advised. The most authoritative text on the subject is found here. Verhaert L 1999 Journal of Veterinary Dentistry 16: 2, 69-75. These permanent teeth can theoretically be treated by three options. Not all options are available to all cases. These options are described below and are either surgical removal of the lower canines teeth (and possibly incisors also), crown amputation and partial pulpectomy or orthodontics via an inclined bite plane bonded to the upper canines and incisors. The latter option may not be available to all dogs if the diastema (space) between the upper third incisor and canine is too small for the lower canines to move into or if the lower canines are located behind (palatal) to the upper canines. 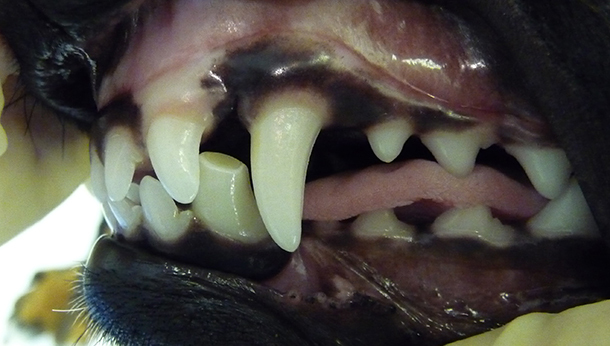 This is our favoured option and involves reducing the height of the lower canines to that of the adjacent incisors. This is a sterile procedure to reduce the height of the lower canine crown that exposes the pulp. It requires a removal of some pulp (partial coronal pulpectomy) and placement of a direct pulp capping. This is a very delicate procedure and carries very high success rate (in our hands) since the availability of Mineral Trioxide Aggregate (MTA). We have used it as the material of choice since 2005. The previous agent (calcium hydroxide) was much more caustic and tended to "burn" the pulp. The success rate of MTA treated cases is quoted as 92% in a seminal ten year study based in vet dental clinics in Finland. This compares with 67% when caclium hydroxide was previously the agent. Luotonen N et al, JAVMA, Vol 244, No. 4, February 15, 2014 Vital pulp therapy in dogs: 190 cases (2001–2011). The intention of the procedure is to keep the pulp alive and allow the shortened lower canines to develop normally and contribute to the strength of the lower jaws. Radiograph left lower canine before (left) and immediately after (right) surgery. Note the immature morphology of the canine teeth - thin walls and open root apices. In order to monitor this process of maturation we need to radiograph these teeth twice at 4-6 months post-op and again at 12 -16 weeks post-op. This is a mandatory check. The quoted success reate of 92% implies 8% failure. Half of those to fail in the Luotonen study happened over a year post-op. To ensure any failure of maturity is identified we will not perform this surgery unless the owner agrees to this. Left lower canine 18 weeks post-op. Access filling intact. The left radiograph shows the left lower canine immediately after crown amputation and partial pulpectomy. The right radiograph is same tooth 18 weeks post-op. Note the thicker dentine walls, development of an internal dentine bridge between pulp and direct pulp cap and the closed and matured root apex. These three criteria indicate a successful procedure at this stage. The advantage of this procedure is that the whole of the root and the majority of the crown remain. The strength and integrity of the lower jaw is not weakened by the procedure and long term results are very good due to the use of Mineral Trioxide Aggregate as a direct pulp dressing. Surgical extraction of the lower canine may seem attractive to clients as the problem is immediately dealt with without the uncertainties of orthodontics and the post-op check that is part of any crown amputation procedure. However, many owners are concerned (rightly) about the loss of the tooth and the weakness it may cause to the lower jaw(s). It is not our preferred option. This is not an easy surgical extraction and the resulting loss of the root causes a weakness in the lower jaws. This is compounded if both lower canines are removed. As this is an elective procedure (e.g. sterile) it is possible to use a bone allograft to fill the void created by the loss of the large canine tooth. The graft will promote new bone growth within a few weeks. Grafts can be very expensive as the void to be filled is large. This can increase the cost of the procedure markedly. 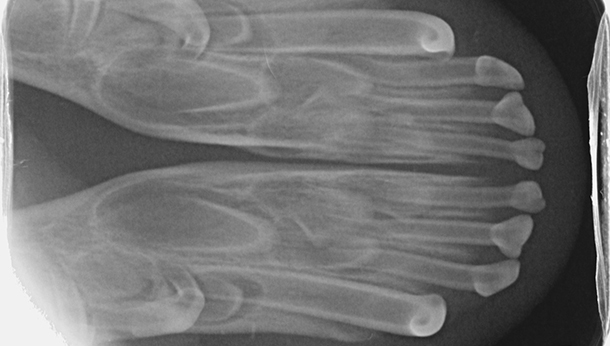 Lingually displaced lower left canine and root radiograph before surgery. Image left lower canine area after surgical removal . Radiograph shows deficit in mandible once tooth no longer present. Radiograph of socket once osteoallograft placed. In some mild cases of lingual displacement we may be able to use crown extensions for a few weeks. For this treatment we bond composite resin extensions on the lower canines to increase the crown length by around 30%. This allows the lower canines to occupy the correct position and also provides more leverage to tip the crown tips buccally. The crown extensions remain in place for around 2 months and are then removed and the tooth surface smoothed and treated. The major downside is that if the dog damages or breaks them off, you need to return here for repairs. Sticks and other hard objects can easily cause damage and some toys also have to be withdrawn for the treatment period. Orthodontic tipping as a treatment has the least certain outcome of all three option. It might seem less invasive than surgery but does require very careful case selection and management. Normally a composite resin bite plane is bonded onto the upper teeth (see below) with an incline cut into the sides. The lower canine makes contact with the incline when the mouth closes and, over time, the force tips the tooth buccally. This takes around four to eight weeks. The lower canine will often migrate back into a lingually displaced position when the bite plane is removed. This can occur if the tooth height of the lower canine is too short (stunted). If the lower canine is not self-retained by the upper jaw when the mouth is shut further surgery may be required. Orthodontic treatment will also conceal a defect and will not be performed unless the patient is neutered. In addition we have an ethical obligation to inform the Kennel Club of a change in conformation. The images below show a lingually displaced left lower canine before treatment and after application of a bite plane. The bite plane remains in the mouth as long as it takes for the power of the bite to tip the lower canine into the normal position by pushing it up the incline. Not all dogs or owners are suited to this. Bite planes can become dislodged if the dog bites a stick or other hard object. Bite planes also need cleaned and adjusted from time to time under sedation or anaesthesia. All of this means more travel and expense for you and more anaesthesia for your pet. It is our view that if a treatment has uncertain outcomes built in it should probably not be used.